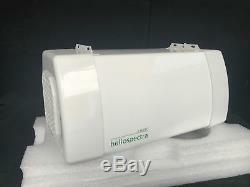 Heliospectra LX601C LED Grow Light. Heliospectra LED lights are designed to yield the highest quality crop with a fully customizable spectrum for unparalleled brix levels and potentcy. Heliospectra, a world leader in intelligent lighting technology introduces a new generation of intelligent lighting systems, the LX60. The patented LX60 system is more effective, less expensive and more energy efficient compared to previous products. Designed to give the yield of a 1000W HPS light. Use this fixture to design your spectrum for optimal growth and quality of your crop. In a study done by the University of Akron, Heliospectra units came out best in terms of Brix results to measure sugar values in plants, and in taste and consistency. Reduce your energy costs up to 50% over traditional lighting. Optimized light spectrum and custom engineered optics to enhance quality and yield of your crop. Intelligently adapt lighting to the needs of plants through real-time spectrum regulation and intensity adjustment. Heliospectra's patented lighting system allows you to grow plants that look and taste better, have a longer shelf life and increase the overall yield of your operation. At the same time, you have the potential to reduce the energy consumption in your operation up to 50% (actively with our lamps and passively by reducing cooling demand). You can even adjust the growth rates faster or slower by manipulating the light spectrum. The LX60 enhances the utility of your growing area. At Heliospectra, we have developed lighting solutions for a variety of growth regimes that improve the quality of specific plants. As an example, one of our customers was capable of achieving increased branching, thicker leaves and overall better plant vigor. The result was not only greater quality, but also less waste during production and distribution. Another Heliospectra regime significantly slowed plant growth while increasing the plant's overall health. This gave the grower more flexibility and all but eliminated potential waste. Typical Power Consumption: 10.5 to 630 W.
Voltage: 100-240 VAC, 50/60 Hz. Photon flux (µmol/s): 1011 µmol/s (full spectrum in stable operation and 25 ºC ambient temperature). Optics: Primary and secondary optics for two PAR distribution pattern variants (see above). Networking: RJ 45, 10/100Mbit IPv4 Ethernet. DHCP: DHCP for IP address management. Web UI: HTTP web interface for simple management. Network Monitoring: Wifi and/or Ethernet. Status Indicators: Status LED for power/system status indication. Dimensions: 425 × 219 × 199 mm (16.7" × 8.6" × 7.8). Weight: 8 kg (17.6 lbs). Operating Temp: 0 to 40 °C (32 to 104 °F). Housing: Aluminum and durable plastic. Cooling: Active, variable speed cooling. Storage temp: -20 to 70 °C (-4 to 158 °F). Lifetime: 50,000 hours (at ambient temperature of 25 °C rated life to 70% of initial photon flux). Certifications: CE, RoHS, REACH, EN55015, MET (Pending for US and Canada). The mix of colors in the light strongly influences plant development. The areas of the spectrum that drive photosynthesis are highest in the red end (600-700 nm), followed by the blue region (400-500 nm) and lastly, the green region (500-600 nm). Heliospectra Spectral Distribution Our LED light systems make it possible to closely control the intensity of light wavelengths and to accurately tune the spectrum to a specific plant. The spectral distribution of our systems (400nm to 735nm) is consistent with the action spectrum of photosynthesis and key photomorphological receptors. LX601 We currently offer two LED plate types for the LX601 series - the "C" and "G" plates. Each plate type has a set color ratio that has been developed and fine-tuned since our founding in 2006. We have grown a variety of leafy greens, herbs, and flowers under our lights and can confidently say that high quality results can be realized when growing with our lights. The C plate: high PAR light with the addition of Far-Red light. A customized light ratio of. The item "Heliospectra LX601C LED Grow Light Programable Spectrum withWIFI" is in sale since Friday, August 31, 2018. This item is in the category "Home & Garden\Yard, Garden & Outdoor Living\Gardening Supplies\Hydroponics & Seed Starting\Grow Light Kits". The seller is "deansliq1" and is located in Newport Beach, California. This item can be shipped worldwide.